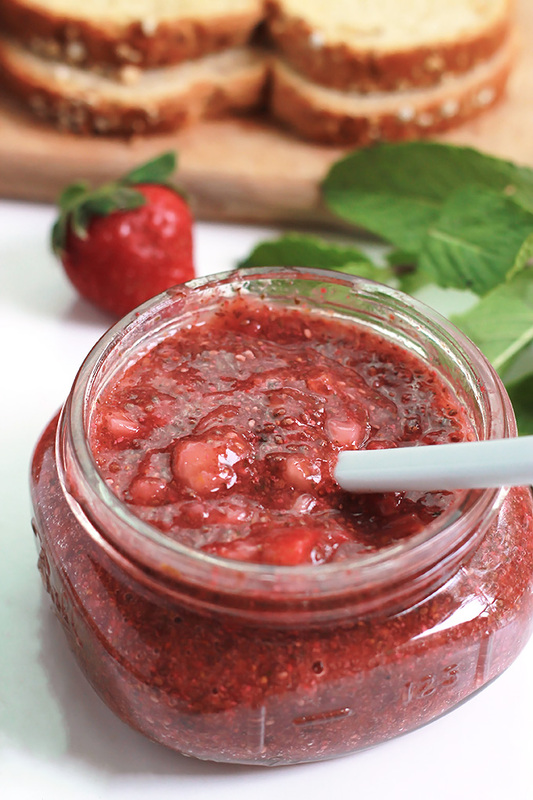 No-Cook Strawberry Mint Chia Jam-filled with flavors of lemon and mint. 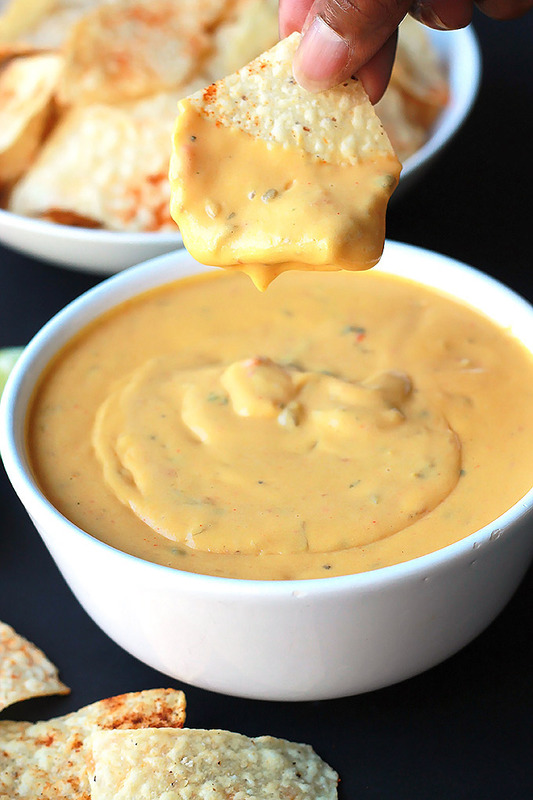 Takes only minutes to make and no stove required. Remember last week when I shared how to make Strawberry Shrub, I told you that more than drinks can be made with the wonderful stuff. 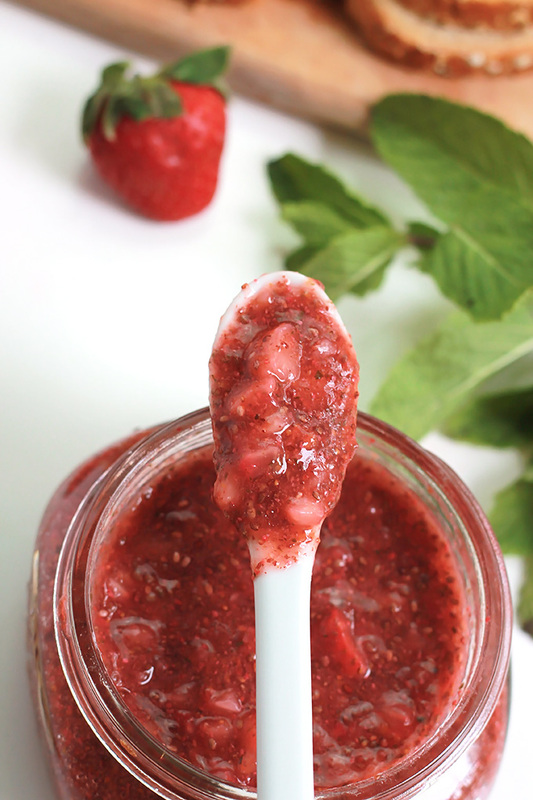 So today I’m sharing my No-Cook Strawberry Mint Chia Jam in which I used Strawberry Shrub as the sweetener. This is one of those quick and easy recipe, no need to turn on the stove-top or oven. 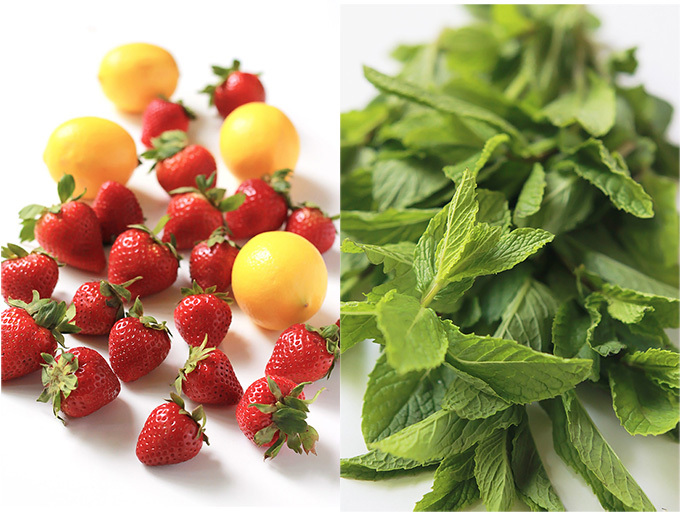 This recipe starts with beautiful strawberries, lemons, I used Meyer lemons, pungent mint. I’ve been loving strawberries lately and it was hard not to eat the ingredients before using them in this recipe . Every third or fourth berry went into my mouth, so sweet and juicy. The lemons I used this time were Meyer lemons. Have you ever wondered what the difference is between a Meyer lemon and a regular lemon? Meyer lemons get their name from Frank Meyer, he brought the Meyer lemon to the US from China in the early 20th century. The Meyer lemon is thought to be a cross between a regular lemon and a mandarin orange. Meyer lemons may be smaller than regular lemons, with smoother deep yellow skin, and Meyer lemons aren’t as acidic, they are sweeter than regular lemons. The rinds of a Meyer taste and smell more herb or spice-like, which adds more complexity. Meyer lemons are more seasonal and best found from December through May. Regular lemons are generally larger, thicker skinned, more acidic and are readily available throughout the year. I couldn’t resist the mint because it was so beautiful and pungent and it adds so much flavor to the jam. 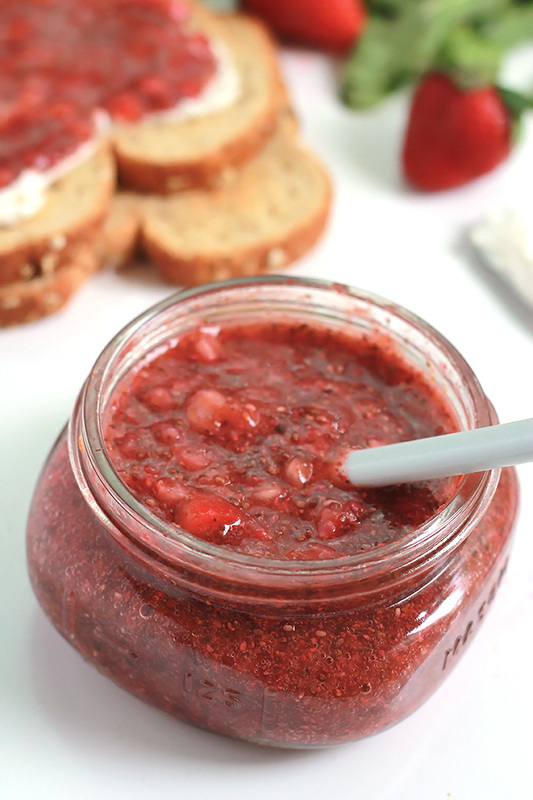 It’s the chia seeds that really give this jam texture. It’s amazing how something so tiny packs such a powerful punch. Increased and sustained energy levels, mental clarity, stable blood sugar levels, bone health, increased fiber intake, weight management and healthy hair, skin and nails, these are just a few of the benefits you may have if you include Chia seeds to your daily diet. Just 15 to 20 grams (2 to 3 tablespoons) of Chia a day will provide you with all the omega-3 your body needs. Reference:Dr. Wayne Coates-AZChia.com. Finely chopped strawberries can be added for a chunkier more textured jam, which is what I did for mine. This step is completely optional. If you don’t have fresh berries you can totally use frozen berries or whatever berry is your favorite. This awesome jam is great in yogurt, hot cereals, ice cream, on toast, pancakes, waffles and in your favorite nut butter sandwich. And by the way, this jam makes a great gift if you don’t eat it all yourself. Place strawberries, shrub, lemon juice, zest, mint and chia seeds in a blender. Puree until mixture is your desired consistency. 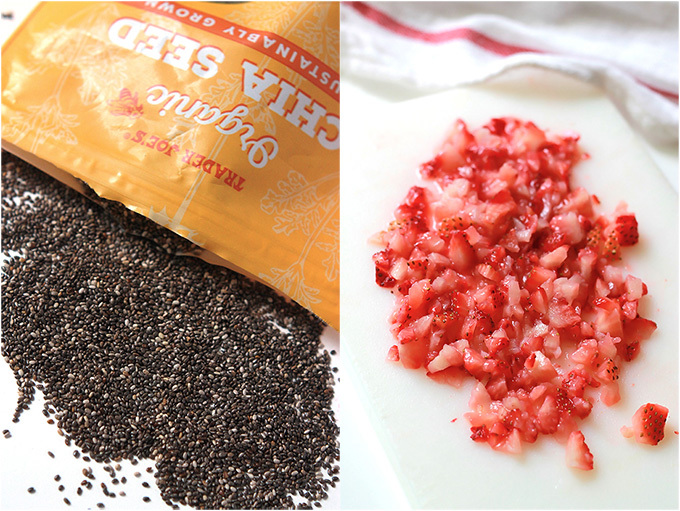 Transfer mixture to a bowl and add in the remaining chia seeds, and strawberries. Mix well. You canals add in more mint if you like. Transfer to glass jar seal and place in the fridge several hours or overnight. Jam will thicken as it cools. Jam should keep in the fridge 2 week to 10 days. If you make this recipe or a version of it, take a picture and share with me on Instagram, tag it #thewholeserving or leave a comment below. 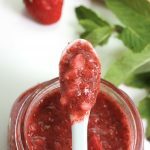 I’d love to see or hear about your version of No-Cook Strawberry Mint Chia Jam. I have been making chia jam out of frozen berries on the stove top. I love your idea to just whiz it in a blender! The mint sounds like a great addition! Hi Alison, I have never had chia jam cooked. I’ll have to give it a try so I can compare the two techniques. However, I like that this one takes no time to put together. Let me know how you like this one. I have made strawberry jam before but never thought to add the chai seeds. I like that idea. I have to try this. I’ve been really wanting to try making a chia seed jam. Strawberry is my favorite fruit, so this is the perfect recipe for me to try! It sounds soooo yummy. Thanks Jenna for stopping by. Let me know how it goes. This looks delicious! I love strawberries, but have never had strawberry and mint together, and have never heard of Meyer lemons. I will have to look for some ne t time I go to the store. I’ve just recently tried Chia seeds, didn’t realize they were so healthy for you. I will have to add those to my regular diet. Hi Linda, I think the combination of the strawberrire, lemon and mint makes this recipe sing. If you can’t find Meyer lemons just use regular lemons. Let me know how it goes.Hope you are having a wonderful week. I probably pinned this before but I’m pinning it again. My mouth was watering looking at your pics. Celeste something has to be done, ever since I started blogging I’ve been making too many yummy recipes and packing on the pounds. Now I know what Meyer lemons are thankyou. Your jam looks wonderful – I’d like to reach in and steal a spoonful to smother on a wedge of French stick. Thank you Jane, I hope you have a chance to try it. Right now at my local Trader Joe’s they have Meyer lemons and I taking advantage and grabbing and enjoying them while they are still in season. Thanks, you have to give it a try! Wow this looks amazing and I love that it is no-cook too! chia has so many health benefits too, the sneaky superfood! Thanks for sharing over at #YumTum this week! Thanks for explaining Meyer Lemons! I did not know the background. This flavor combination is lovely. What a perfect jam for summer. 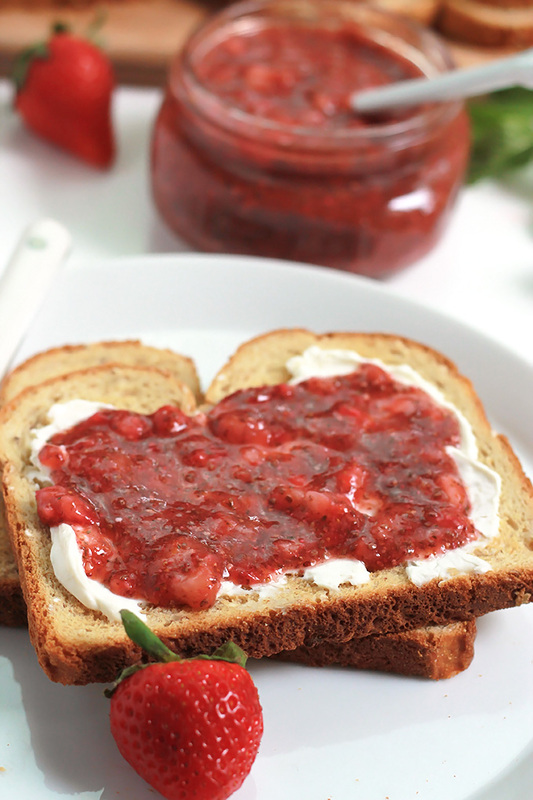 I love that this yummy jam is so easy to make! I’m adding this to my must make list! 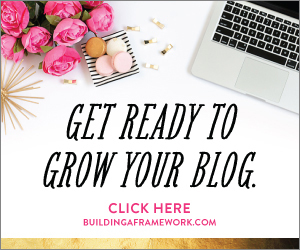 Pinning and sharing too! Your jam recipe looks delicious! Would love some on my toast this morning. Thank you for joining Delicious Dishes Recipe Party. We hope to see you again!